Welcome to Suncook River Powder Coating. We are a full time Powder and Ceramic Coating shop located in Bow, N.H. . We also do media blasting and vinyl lettering/decals in house. We are a custom shop where no job is to small and we can do any metal item that fits in our 4'x6'x6' oven. We have seperate cleaning, masking, spraying and oven areas. We currently are doing a lot of custom motorcycle and automotive work, but do anything from old lanterns, metal furniture, bicycle frames, to batch jobs, etc. Give us a call for quotes or more infomation. We accept Visa, M/C and Paypal. 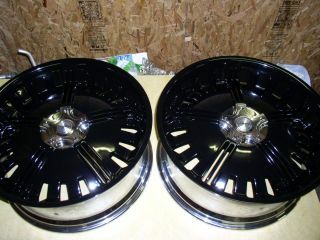 24inch Rims done in Wet Black.